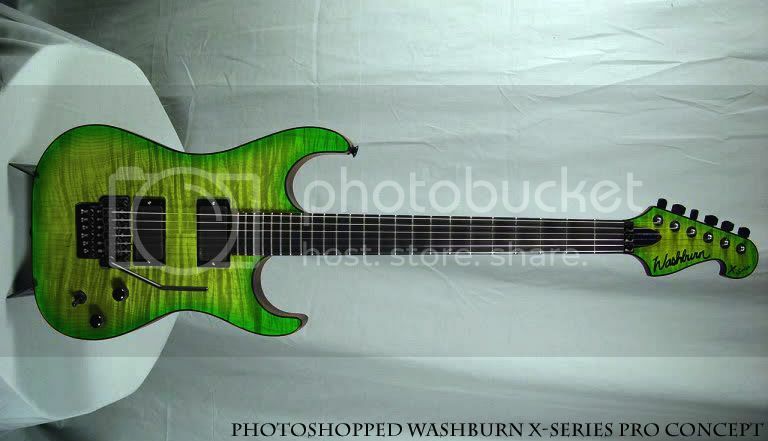 New 2011 Washburn X 51VPRO X-Series ideas! future X-**VPRO model (assuming they don't discontinue the X-series). Hope the guys at Washburn get wind of these ideas. stock binding as well)* Original Floyd Rose is a must! Possibly with all Black body, neck & head stock binding? Quilted Trans Ice Tea Burst? You really are rather good at photoshopping up this stuff. This certainly looks like the sort of thing Washburn could turn out based on existing line, but who knows what's going to happen. It's all been very quiet since the launch of the new Idol, has anybody seen one in the flesh outside NAMM? This one would be a dream come true. The green one looks best. I regret to inform you all that the X series has now been discontinued. I wish I was told this before I made these concepts. Ohh well, the pictures look good at least lol. Send the pics to Nick. brad22386, they made what your talking about in 2009 called the x200 vpro with grover 18:1,24 fret,SD custom-custom, SD 59, coil tap,licensed floyd rose,maple neck, agathis body,and all black.plays like butter,great tone and sustain originally retailed for $1299 and sold in stores for $799, when they discontinued the model it sold for $349 with washburn delux gig bag and free shipping from world music supply.com , they might still have a few left. Anyway you look at it its a steal. I know I have one. x200 vpro, good looking guitar for only 349.00. there still in stock. Tom.